What is Tednonitis (by the way)? Time and time again I have clients come in to Focus Bodywork for soft tissue work on tendonitis that’s been diagnosed a physician. Although these clients have seen their physician and have been dutifully performing their physical therapy assigned exercises, somewhere in our discussion it dawns on me that no one has explained (in understandable language) to these clients what tendonitis really is. I believe that you will make the best choices as to how to heal an injury, how fast to return to training and what warning signs to notice if you understand what exactly your injury is. Tendonitis (direct translation: inflammation of a tendon) is a common overuse injury that can occur to any tendon in the human body. Some sports are notorious for specific tendonitises’. Climbing, for example, is associated with bicep tendonitis, and sprinting with Achilles tendonitis. These injuries are so common that most of us will experience one or several tendonitises’ in a lifetime, so let’s make sure we all know what is really going on in our bodies when this happens to us. Anatomy: A tendon attaches a muscle to bone. It is made of fibrous connective tissue. Although it does not contract the way a muscle does, it has an elastic quality and stretches like a rubber band so it can passively change length. Injury Pathology: When a muscle is overused it gets micro-tears. With adequate rest these tears will repair on their own in a day or two, but often not enough time is given for tissue repair. The muscle becomes sticky and frayed, which makes it unwilling or incapable of lengthening completely. With the muscle going through a shortened range of motion (ROM), the tendon is put under increased stretch. 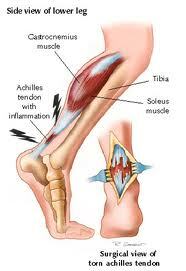 If this state exists for a while without the muscle healing, the tendon starts to fray and becomes inflamed. Tendons do not have a great blood supply like muscle tissue does so the inflammation stays in the tendon and irritates the nerve receptors, which make the area hurt. Signs and Symptoms: The most common presentation of tendonitis is pain at the onset of activity but, as you warm up (about 20 minutes), the pain subsides or disappears. The pain is usually constant but localized. You may feel great by the end of your workout, but several hours later the area is painful again. After periods of rest, such as first thing in the morning, the area usually aches and feels tight. Often a few days of rest makes the area feel better but, as soon as you try to train again the pain comes right back. What to do: Ice (at least four times a day, long enough for the area to become numb and with enough time between sessions for the area to completely return to body temperature). If you suspect you are injured, and a few days of rest and regular icing have not resolved the issue see your sports medicine doctor for a diagnosis. Your doctor will typically recommend six weeks of physical therapy, which if unsuccessful, will usually be followed with a cortisone injection or other more drastic modalities. How Focus Bodywork can help: Some athletes are lucky, and well-managed strengthening and lengthening of the injured muscle/tendon complex will heal the injury. Many are not so lucky, or this is a repeat injury. Through soft tissue manipulation we release adhered areas of the muscle that are not lengthening adequately and torturing the tendon. We treat the tendon area through cross-fiber friction to align frayed fibers in the same plane as the healthy fibers and increase blood supply to the injury site, which flushes out inflammation and saturates the area with nutrients. In some cases, especially when tendonitis is chronic or repeated, there are underlying issues, such as muscle imbalances, fascial binding or adhesions in other muscles altering movement patterns, that lead to the overuse of a tendon. We will sleuth out these hidden culprits and help you resolve them so that you heal well and once and for all! Hopefully this explanation will help you make good decisions on what to do if you are suffering with a tendonitis. Good decisions, such as not pushing through the first 20 minutes of your workout until the pain subsides, and treating not only the painful tendon but the injured muscle as well, will help you recover fully and get back to training as soon as possible. 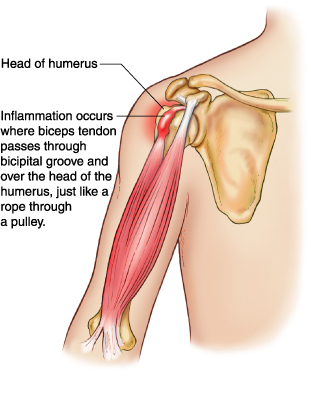 This entry was posted in Sports Injuries and tagged tendonitis by focusbodywork. Bookmark the permalink.